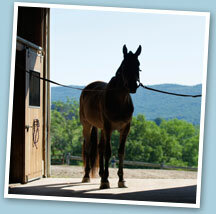 Looking after your horse’s home is vitally important for their physical and mental health. Here, eight equine experts share their advice for making sure horses are safe from harm while being secure and happy in their surroundings. ‘Ragwort can cause serious and irreversible damage to horses’ livers, so it needs to be removed from all fields where your horse will graze or from which hay is cut. Don’t be tempted to pull out plants and leave them in the field, as wilted ragwort is more palatable to horses and just as toxic.